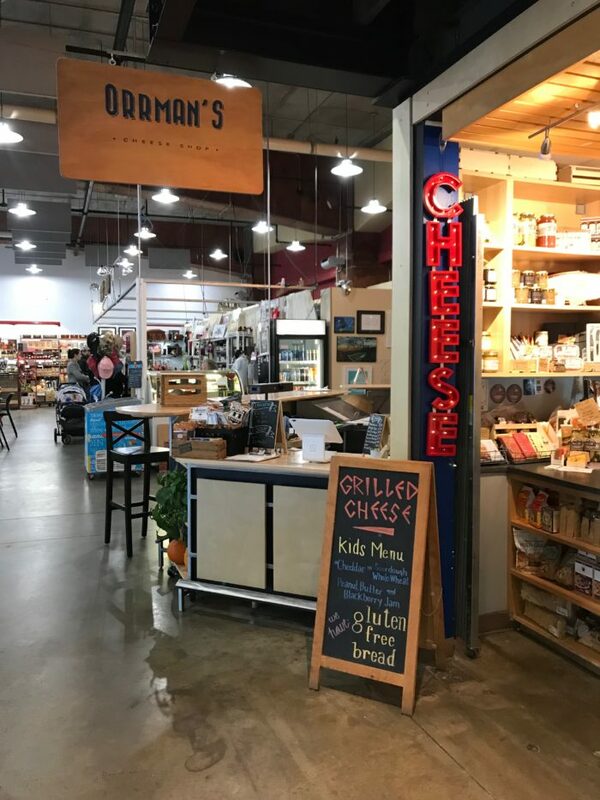 Orrman’s, a gourmet cheese shop at 7th Street Public Market, hosts a special Raclette Night every Thursday from 4 – 8 p.m.
Raclette, a wheel of semi-hard cheese that’s fired under a broiler and then scraped onto your plate, is the star of the show. You’ve probably seen this kind of dramatic melty cheese scrape making the rounds on social media. 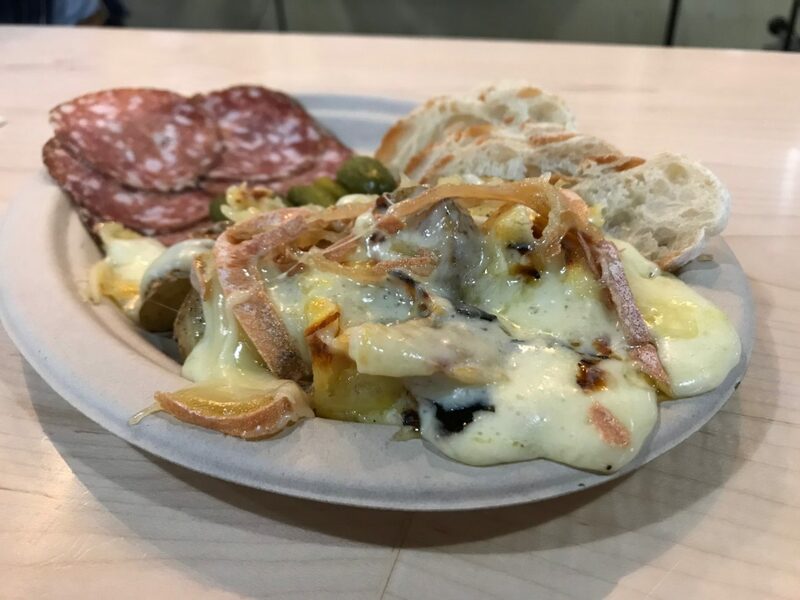 Raclette, an aptly named raclette-centric restaurant in New York City, has received a ton of coverage for its take on the Swiss and French tradition. Now you can get it right here in Charlotte. 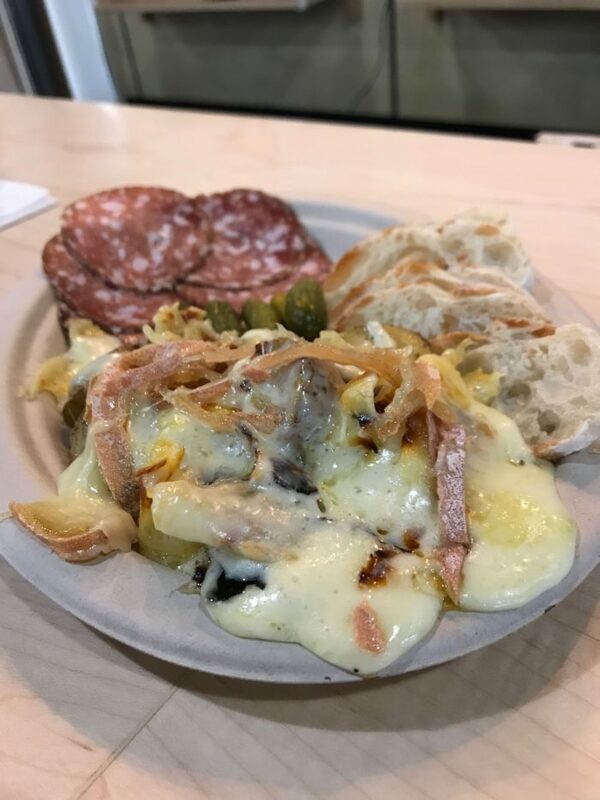 (1) Raclette is available Thursdays from 4 p.m. to 8 p.m.
Orrman’s Cheese Shop is located inside 7th Street Public Market at 224 E. 7th Street. Park in the adjacent deck and bring your ticket inside to validate it. (2) Order at the register and then grab a seat at the counter. This is where the broiler is so you’ll be front and center for the cheese action. (3) You’ll get a plate of roasted potatoes, sliced baguette, cornichons and charcuterie. It’s $10 for the standard plate and $13 to add meat. I ate one by myself and thought that was normal until the couple next to me shared one. Live your life. (4) Wait for a generous waterfall of bubbly hot cheese to be scraped on top. The wheel sits under the broiler right in front of you for 2-3 minutes before it’s scraped directly onto your plate. 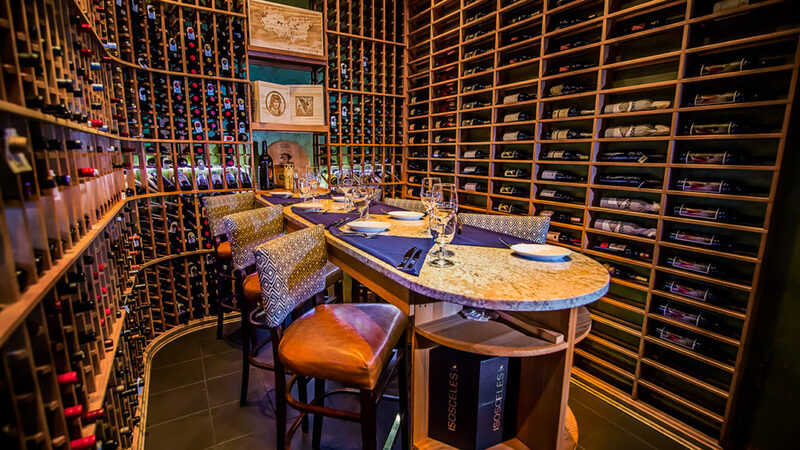 Upgrade your cheese experience by pairing your plate with a wine from Assorted Table, a nearby market vendor. 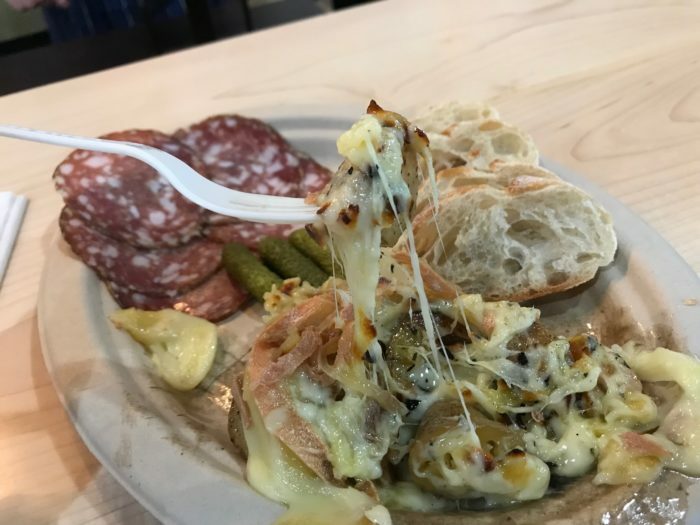 Raclette pairs best with white wine. 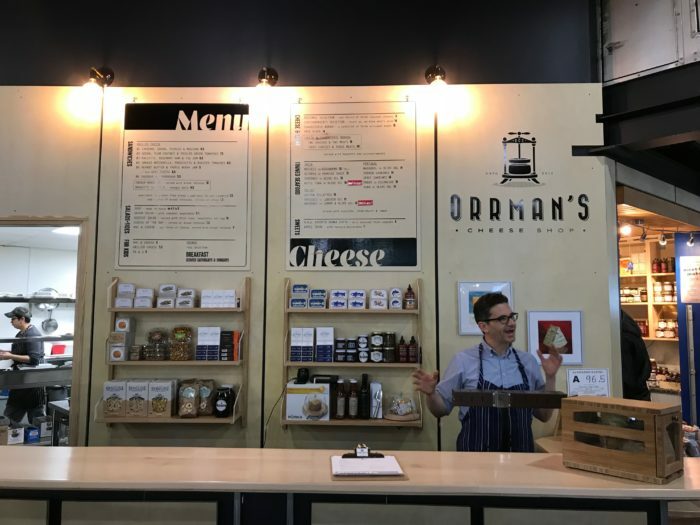 Just let them know you’ll be dining at Orrman’s and they’ll make a perfect recommendation for your mountain of melted cheese. Want even more cheese? 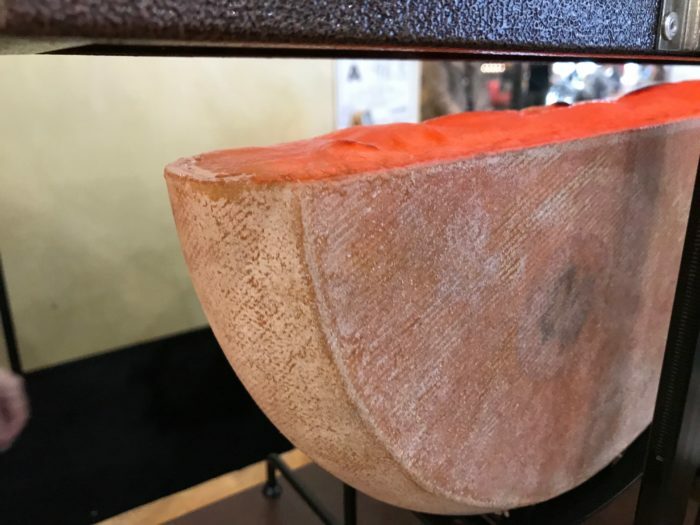 Halcyon has a raclette offering on its lunch menu — Potatoes Alpental ($15) with fingerlings, duck confit and cornichons topped with raclette, mustard and parsley — and The Swiss Society of Charlotte will be hosting its annual Raclette Night on Saturday, February 17. Tickets are $35 for non-members.